The Police Nationale, formerly called the "Sûreté", is considered a civilian police force. Its origins date back to 1812 and was created by Eugène François Vidocq. In 1966 its name was officially changed to "Police Nationale". It has primary responsibility for major cities and large urban areas. The Police Nationale are under the control of the Ministry of the Interior; its strength is roughly 150 000. The Gendarmerie Nationale is part of the French armed forces. It has the primary responsibility for policing smaller towns and rural areas, as well as the armed forces and military installations, airport security and shipping ports. Being a military force, the gendarmerie has a highly centralized organization structure. It is under the control of both the Ministry of Defence and the Ministry of the Interior (as far as its civil duties are concerned). The Gendarmerie's origin dates back to 1306 C.E. when King Phillip le Bel formed the first mounted military police force called the "Maréchaussée". Between 1697 and 1699, King Louis XIV asserted his authority over police in France and the Maréchaussée became the formal law enforcement arm of the country. In February 1791 it was renamed gendarmerie nationale by the revolutionary government of France. 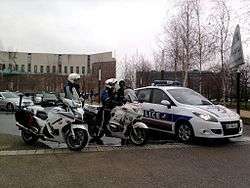 Today there are about 105 000 gendarmes in France. Direction générale des douanes et droits indirects, a civilian customs service more commonly known as the "Douane", under the minister of budget, public accounting and civil servants; its strength is roughly 20,000. The municipal policemen can notice all the breaches but cannot investigate. There are also local polices in the rural zones, as for the rural policemen the police rurale as such does not exist. Note the heterogeneousness of local polices both in means and in equipment. Police municipale are the local police of towns and cities in France. 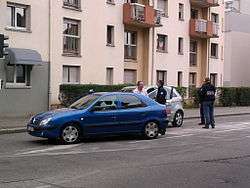 The French municipal police are under the direct authority of the mayor. The leadership of both agencies is centralized and they both have conventional deviance control responsibilities respectively except in different geographical locations in France. 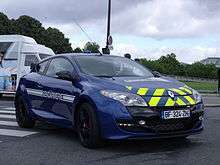 The Police Nationale is responsible for Paris and other urban areas whereas the gendarmerie is responsible for small towns and rural areas with fewer than 10,000 inhabitants. The existence of two national police forces with similar goals and attributions, but somewhat different zones of activity, has at times created friction or competition between the two. Their merging has sometimes been suggested. In French, the term "police" not only refers to the forces, but also to the general concept of "maintenance of law and order" (policing). judicial police (police judiciaire), handling penal law enforcement and investigation of crimes and felonies under the authority of two Examinating Magistrates (juges d'instruction) in every case. Until 1984, the National Police were involved in the prehospital rescue operations and casualty transport (called police-secours). 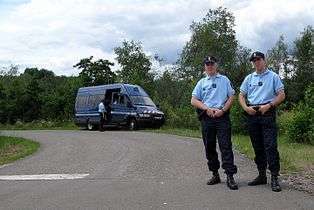 The prehospital aid is now performed by the Sécurité civile (Civil Defence Agency) and by firefighter services; however, mountain rescue is shared between the gendarmerie's PGHM (pelotons de gendarmerie de haute montagne, High Mountain Platoons of the Gendarmerie) and the National Police's CRS (compagnies républicaines de sécurité; Republican security companies). Both the police and the gendarmerie have SWAT teams. 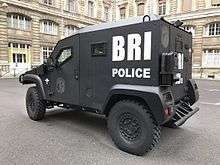 The gendarmerie has the foremost and best-known, the GIGN; the police have the RAID and the GIPN groups. The gendarmerie also has armoured and paratroop squadrons. In particular, outside of crimes in flagrante delicto, law enforcement forces may not conduct searches or arrests without a specific commission from the investigative magistrate. Depending on legal status of cases, not all law enforcement officers are able to act; some powers are restricted to those with special legal qualifications (see next section). Renault Trafic from riot units known as Compagnie Républicaines de Sécurité. ↑ Weisheit, Ralph (2015-08-23). Pursuing Justice: Traditional and Contemporary Issues in Our Communities and the World (2 ed.). Anderson Publishing. p. 66. ISBN 978-0-323-29459-1.